SSD Upgrade Benefits Fast, Cool, Silent. Worth The Money? 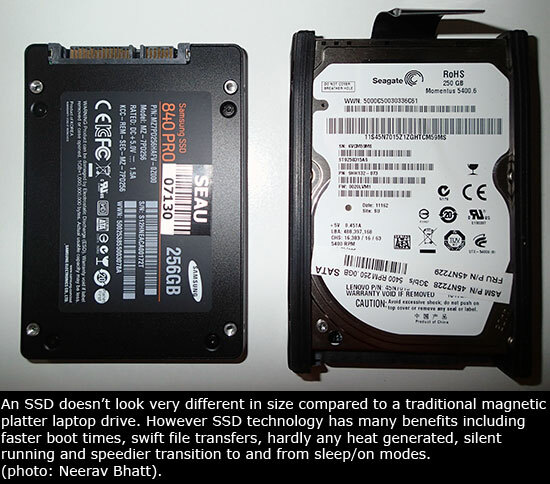 A Solid State Drive (SSD) doesn’t look very different in size compared to a traditional platter laptop drive. However SSD technology has many benefits including faster boot times, swift file transfers, hardly any heat generated, silent running and speedier transition to and from sleep/on modes. Traditional hard drives worked by encoding information magnetically on spinning platters. This information was read and written by heads that floated above the platter. The number of times a platter revolved per minute is one of the determinants of how fast the drive was, lower numbers eg: 5400 RPM generally indicate a slower quieter drive. In comparison a SSD contains basically two things, a controller and a bunch of NAND flash memory that can retain data stored on it without the need for electricity. As a rule of thumb multi-level cell (MLC) SSD’s will be cheaper, slower and less reliable than single-level cell (SLC) SSD’s. For an in-depth explanation of how SSD works I recommend reading Solid State Revolution on Ars Technica. At 75c-$1/GB good quality SSD’s are much more affordable now compared to the past, however traditional platter hard drives offer much more storage for your expenditure at about 5c/GB. Therefore SSD’s are not an affordable option to store all your files. You’ll need to stash bigger files and those which are accessed less often in cloud storage, on a secondary traditional hard drive in your PC case or in a network addressed storage (NAS) box where the files can be accessed by any device connected to your network via ethernet cable or WiFi. Technology enthusiast Derek Jenkins told me that his first SSD investment was in 2010, when he upgraded his HP 8530W EliteBook with a 128GB OCZ Vertex 3 SSD. “Once you’ve owned a machine with the operating system launching from a SSD you can never go back to spinning metal. There’s nothing better than a SSD, other than RAM of course, for giving your machine a performance boost”. “Well, there is one thing better and that’s two SSDs. My current machine, a Sony Vaio Z2 has two 128GB SSDs running in a RAID0 configuration. Windows 7 used to boot in a little over 11 seconds. After a clean Windows 8 installation, and using the ‘hybrid boot’ option, the machine springs to life in a little over 5 seconds”. I’ve been testing a new SATA 3.0 Samsung 840 PRO SSD for the last few weeks and recommend that if you do purchase a SSD, make sure its minimum 256GB capacity. If you economise and buy a 128GB SSD, after the operating system, applications etc are installed there will not be much space left for your own work files, music, videos to watch when travelling etc. Samsung is a unique SSD manufacturer because it can design and manufacture almost all of the components in-house, which allows it to fine-tune the hardware and software to work together. This improves speed and reliability and Samsung backs this confidence up with a five year warranty on the 840 PRO SSD. If you’re buying a SSD to replace a magnetic platter hard drive check which SATA standard your laptop or PC supports. If it’s the older SATA 2.0 standard then save some money and buy the older Samsung 830 series 256GB which costs upwards of $190 compared to the 840 PRO series 256GB which costs $260 or more. I used a Samsung 840 PRO 256GB SSD in a 2.5 year old Lenovo X201 laptop running Windows 7 Professional to see if it was worth the expenditure to extend the laptop’s useful lifespan and save having to purchase a whole new laptop. My experience shows that if your existing laptop has no mechanical issues and the battery is still working fine, then upgrading from a traditional hard disk drive to a SSD does result in significant productivity benefits. Some of my notes from the last few weeks are: significantly faster sleep/wake switching, time big files opened faster, the laptop generated much less heat and less noise, battery life was an hour longer, many applications could be opened all at once without lag time, boot time was faster as were file transfers across WiFi and my wired gigabit network to and from the NAS. A traditional hard drive can be damaged if your laptop is dropped, bumped hard or vibrated a lot. A SSD has no movable parts so is much harder to damage which means less chance of data loss through physical damage. Traditional hard drives can fail despite safeguards like S.M.A.R.T. (Self-Monitoring, Analysis and Reporting Technology). According to data recovery specialists Kroll Ontrack traditional platter hard drives can suffer physical media damage when a head has physical contact with the surface of platter. When head(s) come into contact with the platter it digs into the platter removing a chunk of the media. As the platter spins, debris is scattered causing read errors. Media corruption damage can also occur if a platter hard drive is exposed to a strong magnetic field, affecting both the user data stored on the drive and the critical drive servo information that controls the positioning of the heads. That doesn’t mean a SSD is perfect in comparison. It is important to back your data up locally and offsite eg in the cloud because damaged/failed SSD drives are much harder to recover data from than the old traditional platter hard drives. Looking forward, Kroll Ontrack predicts that the increasing popularity of SSDs will cause individual users and businesses data recovery issues. The complexity of how data is stored on SSDs makes data recovery highly specialized and time consuming. A single SSD recovery can be as complex as a RAID recovery with eight, 16 or even 32 drives. I’m afraid this article seemed very disjointed to me. We didn’t get a real overview of the fundamental benefits and drawbacks of SSD. It jumped around all over the place with bits and pieces like the extra difficulty of recovering data from a corrupted SSD, without any real explanation of why that would be, or anything you could do to minimise that risk. The key decider for me would be the expected MTBF of an SSD. Current rotating disk drives have an MTBF of 2 to 5 years or so, but can fail within 6 months from new. Of course you must backup as often as possible, somewhere between hourly and daily with Apple Time Machine or a Windows equivalent. The S.M.A.R.T. monitoring may give you early warning of the drive failing, but can’t prevent it. What would be the MTBF profile of an SSD ? And how have they overcome the problem of the NAND flash cells eventually “wearing out”. I believe they scatter the data over the NAND arrays as widely as possible, so that no one area gets over-used. And heavily-used files are “migrated” around to even out the “wear” on the cells. No doubt this does contribute to the difficulty of recovery. I’d like to know a lot more about the MTBF and failure modes of an SSD before upgrading. I wouldn’t have time to be replacing my SSD every 24 months, even if I had perfect backups. Next PostNext Coimbra, Portugal – Craving Cuisine & Culture?